I often hear companies use the excuse that their culture is preventing them from adopting Lean product development, or making other positive changes. That’s too bad, because cultural resistance is actually easy to overcome—if you know how. If you’ve read the previous posts in this series about Lean product development, you can skip the next paragraph. If not, I’ll outline how we got here. 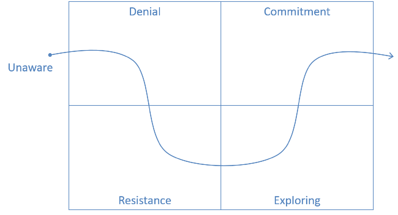 In the first four posts, I talked about how Lean product development is the biggest opportunity you’ll see in your lifetime, and then gave an example of the dramatic results that are possible when you focus on the right end of the value chain. 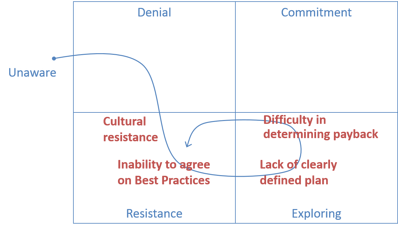 And then I outlined the three best sources for getting started with Lean Product Development (Don Reinertsen, Agile and Theory of Constraints). So now I’ll share what barriers you’ll typically encounter when you start to implement any Lean or Agile methods in your hardware teams, and why cultural resistance is not the problem everyone thinks it is. If you think cultural resistance will be a barrier to change in your company, you’re not alone. 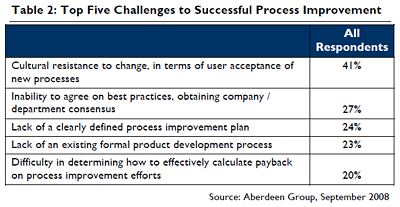 According to the Aberdeen Group report, Getting the Process Right (September 2008), the top ranked challenge to successful process improvement in new product development was "cultural resistance to change." And it won by a wide margin. But I can dispel this myth and explain why it’s not really a problem, and how you can get around it. The diagram below shows the phases a person goes through before they completely accept a change and move on. When you put the list of challenges from the Aberdeen report on this path you can see why it’s difficult to get any kind of Lean product development improvement to stick in a company. For clarity I left out “Lack of an existing formal product development process” because most companies have some form of a process in place. Notice that if you manage to push through the cultural resistance, but you can’t agree on best practices, don’t have a plan, and can’t determine the payback, it’s no wonder you won’t get commitment...! To make matters worse, you can see you’ll be recycled back to the resistance phase where it will be more difficult the second time through. And there’s only a small number of times you can go through this process and fail until the resistance gets so big it’s impossible to try again. Cultural resistance to change is a symptom, not a root cause. I know that sounds controversial, but I can prove it. Mr. Dettmer demonstrates how to develop a Current Reality Tree (CRT) to identify root causes in complex systems. We used them for many year in our diagnosis phase of consulting projects and found them to be very useful for a number of reasons. They not only help you clearly identify the root causes of complex problems, they’re a great way to clearly communicate the situation, get buy-in and consensus from all parties involved, and develop the correct solution. Without going into a lot of detail, you start by listing all of the issues you can think of (usually on sticky notes). Then you sort and order them by cause and effect. And when you’re done, the root causes will be at the bottom, and the symptoms will be at the top. Let’s look at a simple example. To read this, start at the bottom and say, “If…” and then read the bottom box. Then say, “Then…” and read the top box. “If the sun goes down, then the sky gets dark.” Pretty obvious, right? Now try reading it the other way. It’s also obvious that the opposite isn’t true. So now we can be sure which is the cause and which is the effect, or symptom. Without getting into too much detail, in the example above it’s clear you need both of the elements for the effect to be realized. This is called a “conceptual and” and is noted with an ellipse that the arrows pass through. In other cases, the symptom has multiple causes that each add to the effect. Those are called “magnitudinal ands” and are noted by a bowtie symbol with “MAG” in the center. So, if we write down the four issues in the Aberdeen study (leaving out “lack of a formal NPD process” again) and organize them, we’d end up with this CRT. Cultural resistance is the symptom, not the cause! To answer that, let’s look at the phases of change diagram with the necessary solution steps laid out in the right phases. A properly run diagnosis will get everyone out of the denial phase. A solution based on the diagnosis and created with input from the team will generate the necessary buy-in to try something. A successful pilot will eliminate any remaining resistance. And a great result will get commitment to continue. And each time this process is executed successfully, it becomes easier to do the next time! Next week I’ll explain how to get the necessary behavioral changes to stick so that the “Successful Pilot” is actually successful…! Be sure to subscribe to this blog to get the rest of the story. In part 1, we cover the science and economics behind “failing fast” and the optimum rate of failure when learning. In part 2, we discuss why Lean product development really is the opportunity of the century. In part 3, we share an incredible case study that demonstrates the unexpected results that can be achieved when you apply the proper set of Lean product development principles. 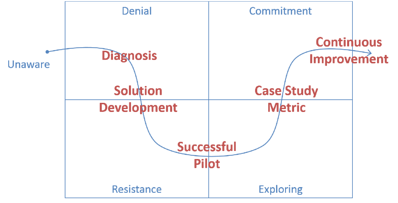 In part 4, we discuss the Lean product development value chain and why in hardware development we have spent too much time focusing on the wrong end. In part 5, we share tips on how to get started with Lean product development. In part 6 we discuss other key principles of Lean product development. In part 8 we share 4 ways to ensure your Lean product development initiative won't fail.